Written by Cecilia Wang. 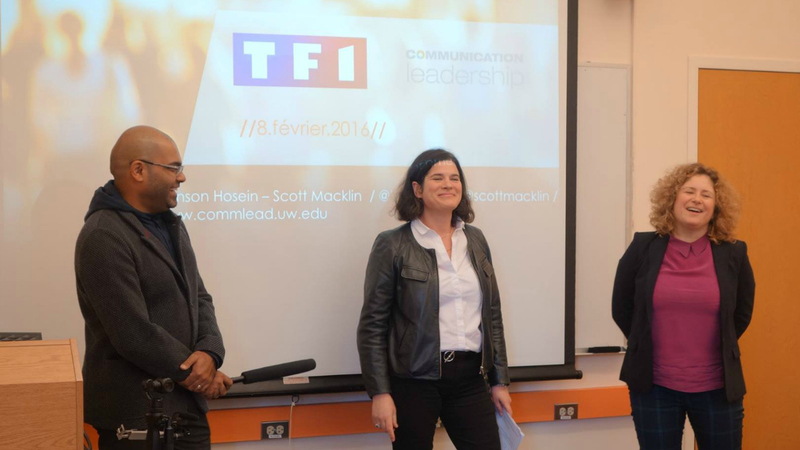 The post TF1 at UW: Developing loyalty with a changing audience appeared first on Flip the Media. 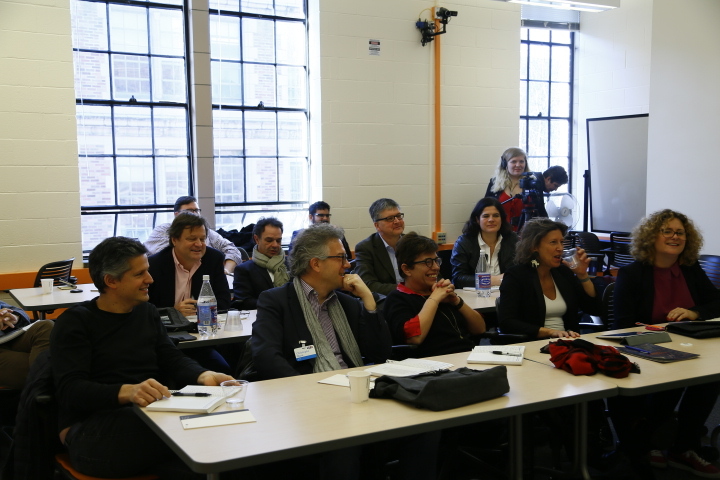 On February 8, a delegation from the private national French TV channel TF1 visited the University of Washington campus to exchange ideas about community-centered storytelling, transmedia, and branding. Since their audience has changed tremendously, they expressed the need to change their content strategy accordingly. 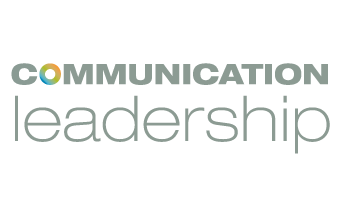 Hanson Hosein, Director of the Communication Leadership (CommLead) program at UW, started the presentation with a brief introduction of CommLead. 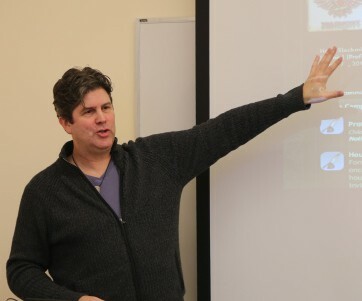 Associate Director of Comm Lead Scott Macklin, CommLead faculty Brent Friedman, and CommLead fellow John du Pre Gauntt also gave presentations. TF1 delegation at UW. Photo by Cecilia Wang. Hosein and Macklin talked about the importance of storytelling and community building. When discussing content creation, Hosein said, the key problem is how we can make connections between content and people who want to be engaged. Since the audience is no longer passive, content serves as the currency to keep the relationship and build trust between brands and viewers. Storytelling’s power lies in its ability to change people’s behavior, including consuming behaviors, thinking procedures, etc. Scott Macklin, Associate Director of CommLead. When asked about how to balance targeting niche markets and maintaining global reach, Hanson noted that brands like Coca Cola are trying to reach specific audience and create personalized experiences for them. However, those specific messages still come from the canon which demonstrates what Coca Cola stands for. On the other hand, Macklin’s presentation centered on one important question: whose interests are being served through the practice of storytelling? By identifying this, the content can be tailored to contribute significantly to satisfy multiple interests and it becomes easier to establish the engagement strategy and measures of success. 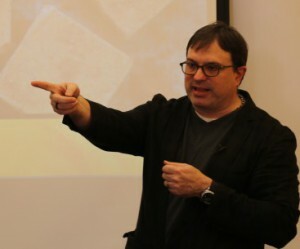 After this, Friedman gave an in-depth presentation about transmedia, an unstoppable trend which he defined as “a franchised extension.” For instance, Star Wars, as a core media property, has accumulated plenty of fans worldwide who want to continue engaging with Star Wars-related content after the movies. Content creators need to think about a narrative that is open to multiple expressions and platforms to keep these fans engaged. Marketers of each piece of media must make sure they all carry the DNA of the original property. Whether it’s games, comics, books, or social media, each piece should target its the specific audience while keeping the big message in mind. Brent Friedman, CommLead faculty member. The key to all of this, Friedman explained, is creating “a universe worthy of devotion.” “[It] has to be built correctly, managed correctly and then, each expression has to be true to the overall principles of the original franchise.” In this framework, there are many opportunities for brands to work with sponsors and weave their stories into the universe that the audience lives in. The value of transmedia is in its ability to build communities and aggregate people who share the same passions. “Once you have people’s attention and devotion, the worst thing you can do is to let it die,” Friedman said. One advantage of transmedia is that the franchise provides multiple ways to continue generating content to sustain interest between major installments. For example, in between Star Wars movies, marketers used transmedia to keep people excited for the next movie to come. One audience member asked Friedman about the impact fan groups can have on the general audience. Friedman explained that even though true fandom is approximately only 10% of the core audience, their halo effect – how their perception of a franchise influences others – always brings in more general audience. With new solutions like beacon technology and visual reality springing up, engagement has been taken to a whole different level. Du Pre Gauntt’s presentation provided a mental filter for all these new technologies and solutions. Since everyone can be a content producer nowadays, du Pre Gauntt explained, it is easy for people to be overwhelmed and annoyed by advertisements. Therefore, the fundamental problem is to use advertisements in a more efficient way and always ask the question “How is this solution valuing human attention?” Only when we identify what signals are people responding to can we build deeper relationship between brands and the audience. Olivier Abecassis, the CEO of TF1, said his key takeaway from the presentations, was realizing the importance of developing relationships between brands, content and users. However, he was concerned that everyone, especially social media, will compete for those relationships. Under these circumstances, the awareness of competition and balance is crucial. When asked about how the audience is changing, Abecassis summarized it by saying that they simply want more. In order to provide them more content and personal experience, TF1 has been working hard to satisfy all their audience’s specific needs. For example, because they noted that the millennial has a more fragmented way of viewing, they created some specific content only for them. In an era of “always on”, people are always on their phones consuming content. Therefore, people want to develop a relationship with a brands and companies more than ever — as long as that relationship is handled respectfully and genuinely.